Our ISO³-WINDOW SEALING SYSTEM provides the suitable sealing solution for many connection situations. Our quality-tested system products meet the stringent requirements of the EnEV and the recommendations of the RAL-Gütegemeinschaft Fenster und Haustüren e.V. (RAL Quality association for windows and doors) in the “installation guide”. Our products can be processed easily, quickly and safely, saving not only energy but valuable working time as well. All the products have been coordinated perfectly in terms of function and application and can be used in any combination. The system includes a range of window connection films for time-saving and air tight sealing, as well as permanently elastic, impregnated PUR sealing tapes which serve as weather protection as well as being used for thermal and acoustic insulation. In addition, we can also supply you in front of wall installations with multi-functional joint sealing tapes which combine all three functions in one product. 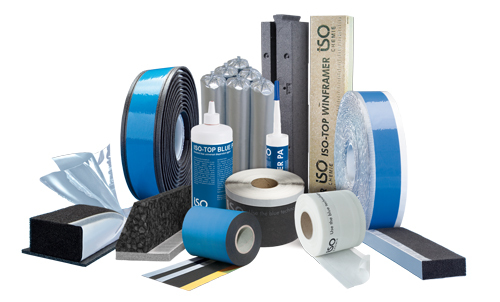 Furthermore we also supply sealants and PUR-foams. *according to manufacturer's conditions (available on request). The penetration of humid room air into the structure is prevented by this level, thus preventing condensation of this humidity at points where surface temperatures are below the dew point. Air tight sealing products are fitted to prevent uncontrolled heat loss and drafts via the connection Joint. Thermal and acoustic protection are guaranteed by this level. The functional area must remain dry and must not be subject to condensation from the room side nor driving rain from the outside. 5 % humidity can reduce insulation by up to 50 %. Our product solutions do not permit this to happen. Level 3 must be designed to resist driving rain, as a wind and rain barrier. Driving rain values of at least 600 Pa are usually required; these are achieved or even significantly exceeded using sealing solutions from the ISO³-WINDOW SEALING SYSTEM.